Delhi has always been an important place for tourists and the common citizens to visit the city for various reasons. Being the capital, it also holds paramount importance. The best way to get into Delhi or to go to other parts of the country from this city is by using the Indian Railways. There are various ways by which the individual can reach Nizamuddin Railway station for catching the train. It could be by using the common modes of transport, like the bus, taxi, or other vehicles that play to the station. The other connectivity by Nizamuddin railway station is the Delhi Metro that is famed for its excellent and on-time services.
! !Most awaited Delhi’s Metro Pink Line Flagged off!! Most-awaited (DMRC) Delhi Metro Rail Corporation’s Pink Line is now open for public use on December 31’2018. Hazrat Nizamuddin is the newly opened nearest metro station of Hazrat Nizamuddin Railway station which is on Pink line of Delhi metro. This 7th Line of Delhi metro was inaugurated by Hardeep Singh Puri (Union housing minister) and Manish Sisodia (Delhi’s Deputy Chief Minister). Delhi metro Pink Line connects the city’s prominent & very popular shopping center markets such as Sarojini Nagar, INA, South Extension and Lajpat Nagar. Due to this big problem of parking in these markets will also be solved. 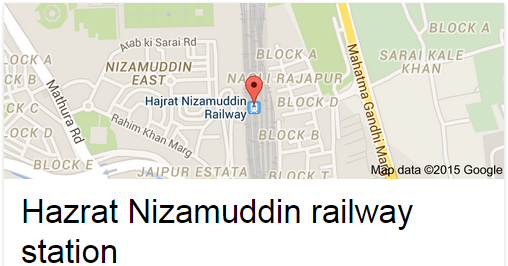 Hazrat Nizamuddin Railway Station is an originating station of so many super-fast trains. Now the trains like Rajdhani and other super-fast on wheels depart from this terminus is easily accessible via the Pink line on the Lajpat Nagar to Mayur Vihar. 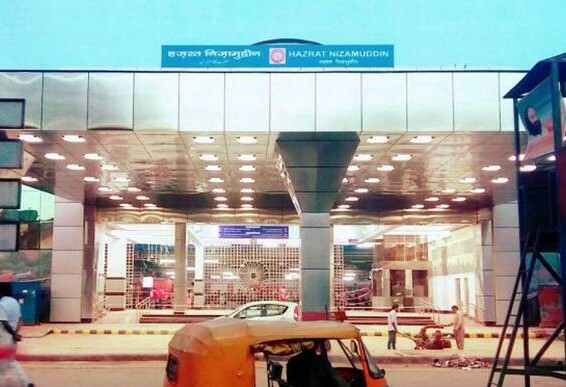 The Pink Line’s Hazrat Nizamuddin Metro station will become one of the network’s major transit hubs as the station provides direct connectivity to the railway station as well as the Sarai Kale Khan Inter State Bus Terminus. Fare details are: Normal (40.Rs) if you start from Noida City center to Hazrat. Time taken: In just 20 mints you will reach with only 1interchnage at Mayur vihar-1. If you are in New Delhi then it will take 24 mints for Nizamuddin & 1 interchange at INA metro station with the Normal fare: 40 rs, and 30 rs on Sunday & national holiday. Indraprastha Metro Station – The nearest metro for reaching Hazrat Nizamuddin Rly station comfortably is the Indraprastha Metro Station. It is regarded to be on Delhi Metro’s Blue Line. One has to alight at this metro station and walk a bit towards the IP Depot, which takes about two minutes. At the IP Depot, one has to take #261 DTC bus towards the bus stop ‘Sarai Kale Khan’ and get down there. Gate No. 2 of this railway station is about a kilometre walk from the bus stop. Total time that is taken to reach Nizamuddin station from this nearest metro station is around twenty minutes. The individual can also avail a rickshaw to reach the station, which takes just five minutes for the travel. With increasing traffic, the state government authorities are compelled to think of ways and means to lessen the traffic flow and to ease it out, especially surrounding the Hazrat Nizamuddin Railway Station. For this reason, the DMRC (Delhi Metro Railway Corporation) had started the project to create tunnel between 5.5 kilometre long underground Lajpat Nagar – Hazrat Nizamuddin stretch on Mukundpur – Shiv Vihar corridor for providing direct connectivity to Sarai Kale Khan Inter-state bus terminus, including Hazrat Nizamuddin Rly Station, which is part of Metro expansion project (Phase III). According to a DMRC press release, Hazrat Nizamuddin metro rail station is to have dedicated exit and entry points that are expected to connect ISBT and H.N. Railway Station. The exit and entry points at the Sarai Kale Khan are to be within the ISBT complex and exit/entry points at the Hazrat Nizamuddin to be inside 50 meters of station complex. Also, there is to be a third exit/entry point towards Smriti Van that crosses the road, which connects to the station. Having the nearest metro station to Nizamuddin railway station is sure to help the passengers to get greater convenience and comfort to reach the station or to exit from it, without much trouble and to use the metro. This new metro station is expected to be opened by 2016 for the public. The underground stretch which is about 3.366 kilometres between Hazrat Nizamuddin and Lajpat Nagar is to witness total six TBM drives, which would include two drives from each of Hazrat Nizamuddin – Ashram, Ashram – Vinobapuri and Vinobapuri – Lajpat Nagar. Delhi, by virtue of being the capital of India, is one of the busiest of the busiest cities in the country. People are constantly hustling and jostling from one place to another and everybody is in a hurry to reach their destination. In fact, Delhi’s traffic is quite notorious, and you can get stuck for hours on end, on any busy day. Thus, when travelling from one place to another in the city of Delhi, make sure that you have enough time in your hands, even if it is a short distance. The Hazrat Nizamuddin Railway station is one of the major railway stations of this city. In fact, it is one of the most congested ones, facing a huge traffic day and night. If you want to catch a Rajdhani Express to any of the South Indian metropolitan cities, then you will have to do so from Hazrat Nizamuddin. It is located near Sarai Kale Khan Bus terminus from where buses meant for interstate travel leave for their destination. Thus, one can only imagine how much traffic this area of the city garners every day. People often need to cover huge distances, literally from one corner of the city to another. With the terrible traffic and the inhospitable weather, especially during the summer months, commuting in Delhi is actually a huge problem. The Delhi Metro is a saviour when it comes to covering large distances. These are not only fast, but they are quite efficient as well. They help in saving a lot of time. The Hazrat Nizamuddin Railway Station has no direct metro stations connecting to it, but it does fall on the extension of the blue line of Delhi Metro. Depending on which part of the city you are travelling from, your route and the means of travel will be determined. Board a Metro from any of the nearest metro stations. Make sure that you take a train on the blue line. Get down at Jangpura metro station. From here, you can get a bus or an auto for Hazrat Nizamuddin. This total journey will take roughly about 45mins – 1 hour, and hence, it is best to keep some time in hand. A total of 100 bucks should be enough for this trip. Connaught Place is located quite near to the Hazrat Nizamuddin Railway Station. It is separated by only 10kms, and hence, it will not take you much time to travel from Connaught Place to Hazrat Nizamuddin. However, it is always best to keep some time in hand, if you have to catch a train. Generally, there isn’t much traffic on this route either. The best way to travel would be to take a taxi or if you have a car at your disposal. It will take about 20mins or so to reach your destination. You can take the road from Connaught Circus that will cross the Indraprastha Marg and then the Subhash Chandra Bose Marg which will ultimately merge with NH 44. A few minutes later you will reach Entry II of the railway station. Take a metro from the nearest metro station in Noida. Catch a train for Pragati Maidan. Get down at the stop and then catch an auto or bus that goes directly to Nizamuddin. The auto fare will be around 40 bucks, and you should not pay more than that. If you want to avoid the hassle of making a break journey from one destination to another, then you can also opt for a taxi. The total ride should cost you around 80 to 100 bucks, and it will take you around 30-45mins. However, since you will be taking the road make sure that you have enough time in your hands, so that even if you get stuck in traffic, you will be able to reach in time for your train. Ghaziabad is around 30kms away from Hazrat Nizamuddin, and it will take you about 1 to 2 hours with traffic to travel to the station by car or on the road. It is quite a long distance that is pretty prone to traffic, and hence, make sure that you have enough time in your hands. The best option to travel from Ghaziabad to Hazrat Nizamuddin is to take the EMU trains. These trains are basically local trains that ply to and from various locations in Delhi, which help regular commuters. These are also quite efficient and help in saving time. There are a lot of trains from Ghaziabad to Hazrat Nizamuddin, even at 3 AM in the morning. All you have to do is check the timings and head out to the Ghaziabad station. If, however, you do decide to travel by car, then you can take 3 routes, one from Madan Mohan Malviya Marg and then NH 24, the other via Haripur Road and the last one directly via NH 24. These routes will depend on your convenience. All these three routes would take about 1 to 1 and a half hour for travelling. While commuting in Delhi, always remember to take the shortest distance and the fastest means of travel. Hopefully, these routes will come in handy when travelling to Hazrat Nizamuddin Railway Station! Want to know about how to do travelling to Hazrat Nizamuddin from Vaishali metro station? Vaishali metro station is on the blue line of the metro railways and is mainly serving the Ghaziabad suburban areas including Vasundhara, Vaishali, Khora, Indirapuram, and nearby arenas. Vaishali metro station is at an approximate distance of 18 kms or 11.2 miles from Hazrat Nizamuddin railway station and by taking an auto or a taxi from there, you can reach there in like 20 to 25 minutes, all depending on the traffic. Hazrat Nizamuddin station is one of the busiest and important railway junctions of the city and trains in large numbers used to go to and fro from the same and thousands of passengers are at the railway station on daily basis. No matter whether it is about reaching Hazrat Nizamuddin station or leaving and going somewhere else from the station, metro services are the best to opt to these days, which are undoubtedly fast and people even don’t need to face the heat and traffic to do that. The nearest metro station to railway station is Indraprastha station that is hardly at 5 minutes distance so in case, you need to get to the station, and wishes to get down at the nearest metro station from the station, then feel free to get down at Indraprastha. Reach safely and timely by using metro services and have a safe travel! Looking for the information related to how to reach Kashmiri gate from Nizamuddin railway station? If yes, here you will get the relevant answer of the same. Kashmiri Gate ISBT is about 13 km away from Hazrat Nizamuddin railway station and directly by hiring a cab or an auto this distance could be covered in total in like 25 to 30 minutes of time, all depending on the traffic and rush. Aside from this, there is another way out that is to board the train from Nizamuddin metro station that is opposite to its railway junction and get down at Kashmiri gate metro station and ISBT is at a walking distance from the metro station. It will take almost the same time span and people could avoid the traffic too. These days, private companies have been in huge demand and people in large numbers give preference to them like Ola and Uber. In case, you are one of them who is much comfortable with the services, then make sure to simply book a cab from the railway station only heading to Jama Masjid and in case it is not peak hours or something, you could be a little bit early at the destination too. Whenever you are in the city, do make sure and try to use metro rail services only as it not only avoids the traffic but also save you from bearing the heat and hot weather of the city and reach at your destination within less time span. Want to know of the Nearest ISBT from Nizamuddin railway station? If yes, read on to the following and come to know of the details. Kashmiri Gate ISBT is the closest to Hazrat Nizamuddin railway station and as per the sources, the distance in between them is of about 13 kms. It will take hardly 15 to 20 minutes of time to cover the entire distance, either via an auto rickshaw or a taxi like Ola or Uber, depending on the traffic and time at which you are out in the city. Hazrat Nizamuddin railway station is among one of the prominent junctions of New Delhi city and hundreds of trains go to and fro from this junction on daily basis. It definitely makes the place very crowded and busy and a large number of travellers move from there, either to nearest metro station or nearest ISBT terminal to catch a bus or metro depending on the need. Kashmiri Gate ISBT in itself is a very busy bus terminal and several buses move from here on daily basis so if you de-board train at Hazrat Nizamuddin and want to take a bus from nearest junction, then move to Kashmiri Gate and for the same you can make use of metro rail services that are not only fast and quick but also efficient. Have a safe journey.